VI.5.5 Pompeii. Casa del Granduca Michele di Russia or Casa dei Vasi di vetro or House of the Glass Vases. Linked to VI.5.6, VI.5.21. Excavated 1837, 1844, 2005 to 2006, 2009 to 2010. VI.5.5 Pompeii. September 2005. Triclinium to the left behind the peristyle, in the north-east corner. Looking east. Helbig identifies in this room: “Room to the left behind the peristyle, Polyphemus, 1047, Oedipus, 1155, Leda, 151”. See Helbig, W., 1868. Wandgemälde der vom Vesuv verschütteten Städte Campaniens. Leipzig: Breitkopf und Härtel. (1047, 1155, 151). 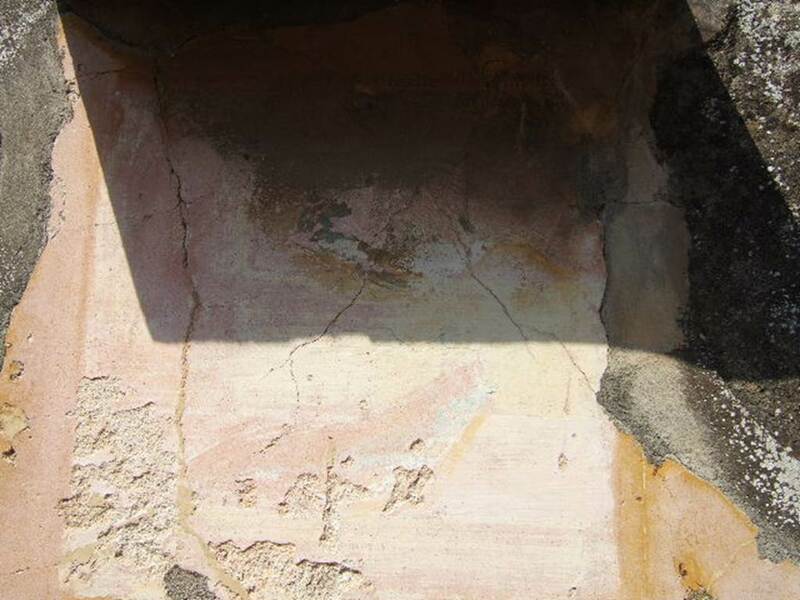 According to PPM, the walls of this room are described as being painted in IV style, above the red zoccolo/dado/plinth it was dividied into panels separated by compartments with painted plants, the middle area of the wall was painted yellow, but the upper zone was faded and colour unrecognisable. 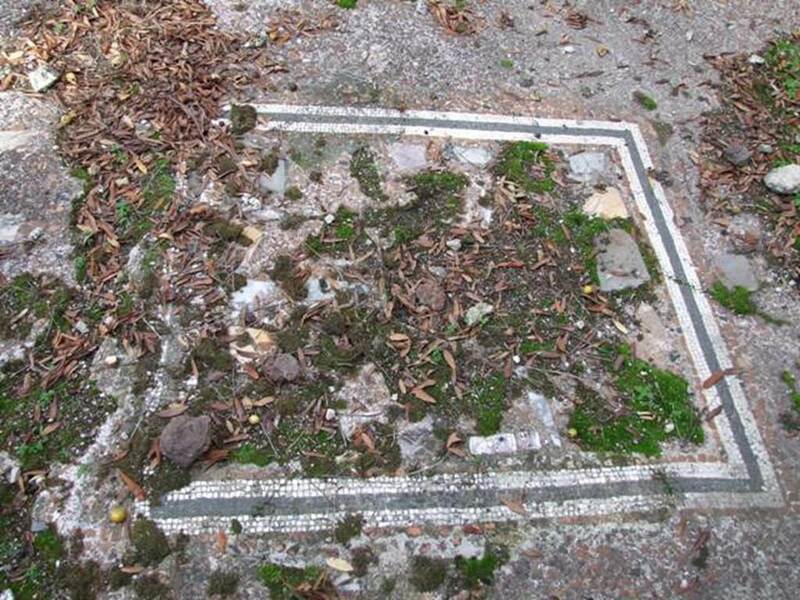 The flooring was cocciopesto, with a border of black and white mosaics enclosing a rectangular area, also of cocciopesto but inserted with tiles and chippings of coloured marble. the painting in the centre of the north wall (left above), which the small lean-to roof did not succeed in protecting so it has now faded and disappeared, was of a still-life with fishes (Helbig 1707). VI.5.5 Pompeii. September 2005. East end of north wall of triclinium to the left behind the peristyle. 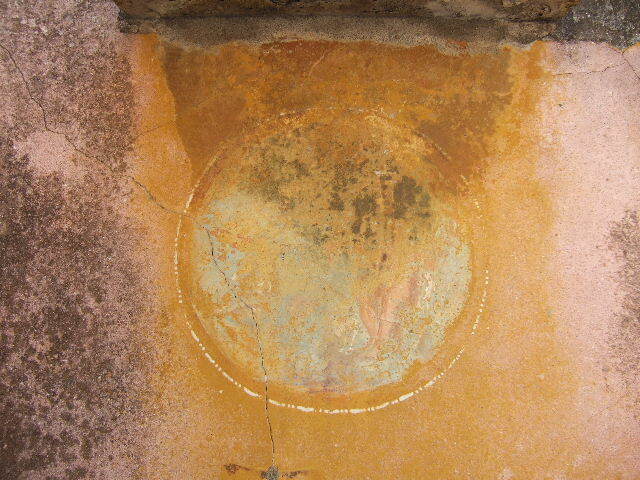 According to PPM, the medallion painted at the east end of the north wall showed Polyphemus and Galatea (Helbig 1047). 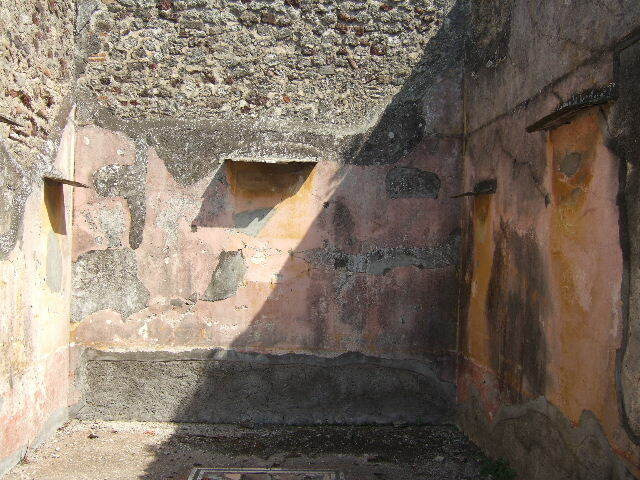 VI.5.5 Pompeii. Pen and ink drawing of Polyphemus and Galatea, by Giuseppe Abbate (1844). Now in Naples Archaeological Museum. Inventory number ADS 159. VI.5.5 Pompeii. September 2005. Central panel on the east wall of triclinium to the left behind the peristyle. VI.5.5 Pompeii. 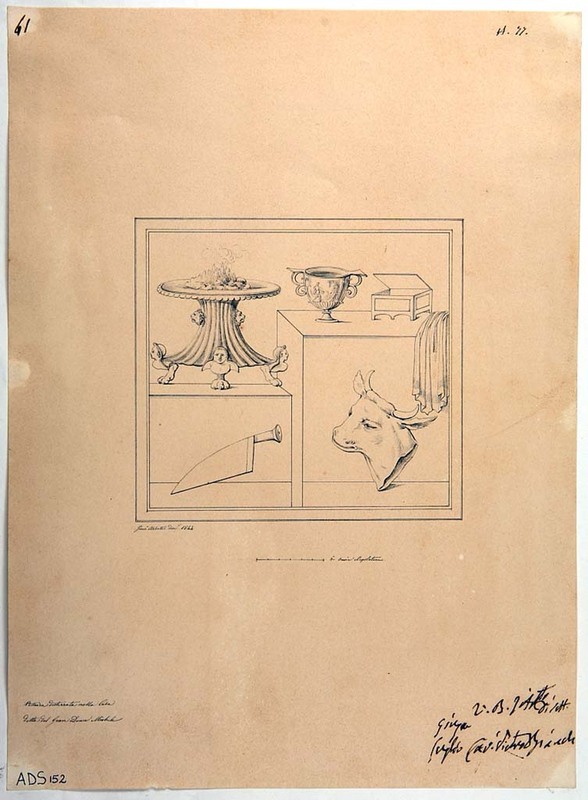 1844 drawing by Giuseppe Abbate showing instruments and elements relating to the sacrifice, including amongst others, the cup, the knife and the head of the ox. (Helbig 1774). Now in Naples Archaeological Museum. Inventory number ADS 152. VI.5.5 Pompeii. September 2005. Central panel on south wall of triclinium to the left behind the peristyle. According to PPP, and Fiorelli, this was a painting of fishes and household goods for the table. (Helbig 1707). VI.5.5 Pompeii. December 2007. East side of south wall of triclinium to the left behind the peristyle. Helbig identifies in this room: Medallion of Oedipus, 1155. See Helbig, W., 1868. Wandgemälde der vom Vesuv verschütteten Städte Campaniens. Leipzig: Breitkopf und Härtel. (1155). VI.5.5 Pompeii. September 2005. East side of south wall of triclinium to the left behind the peristyle. Now in Naples Archaeological Museum. Inventory number ADS 160. VI.5.5 Pompeii. 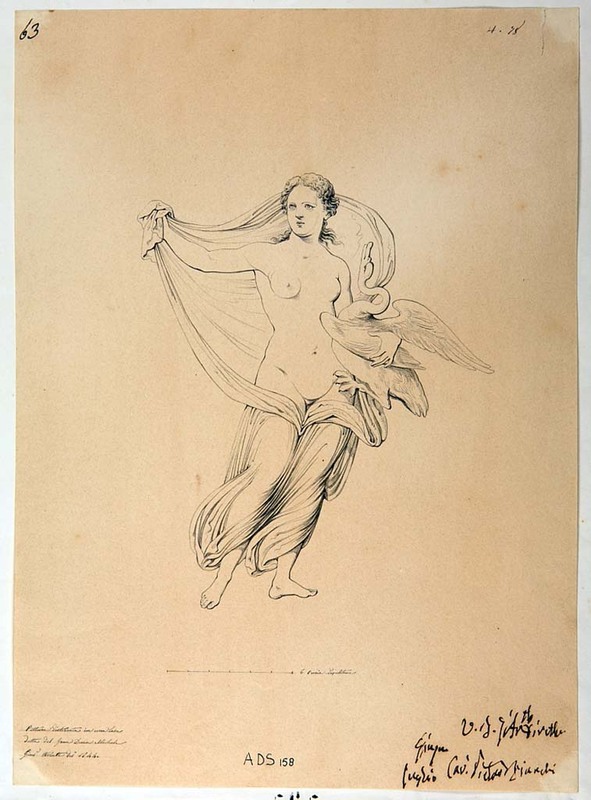 1844 drawing by Giuseppe Abbate of a panel with Leda and the swan (Helbig 151). 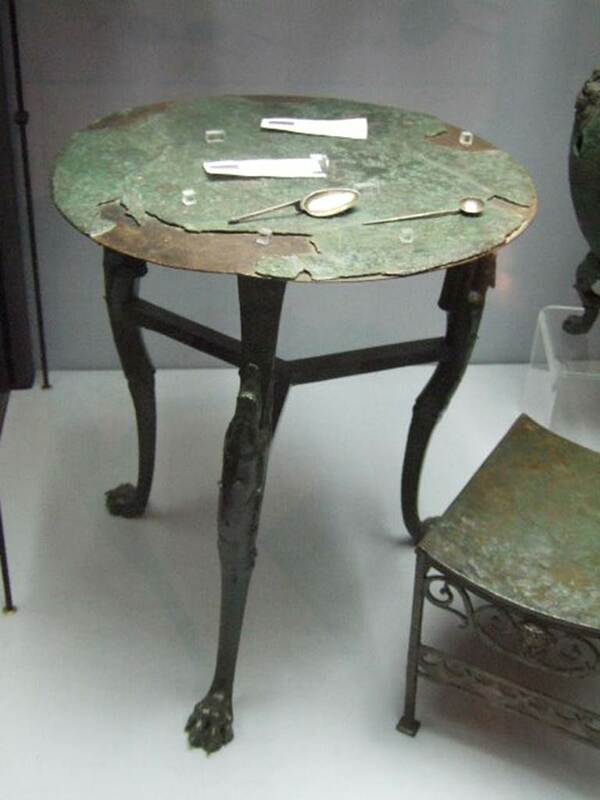 Now in Naples Archaeological Museum. Inventory number ADS 158. According to Helbig’s topographical list, this panel also came from the triclinium, but today the IV Style decoration has disappeared. VI.5.5 Pompeii. December 2007. 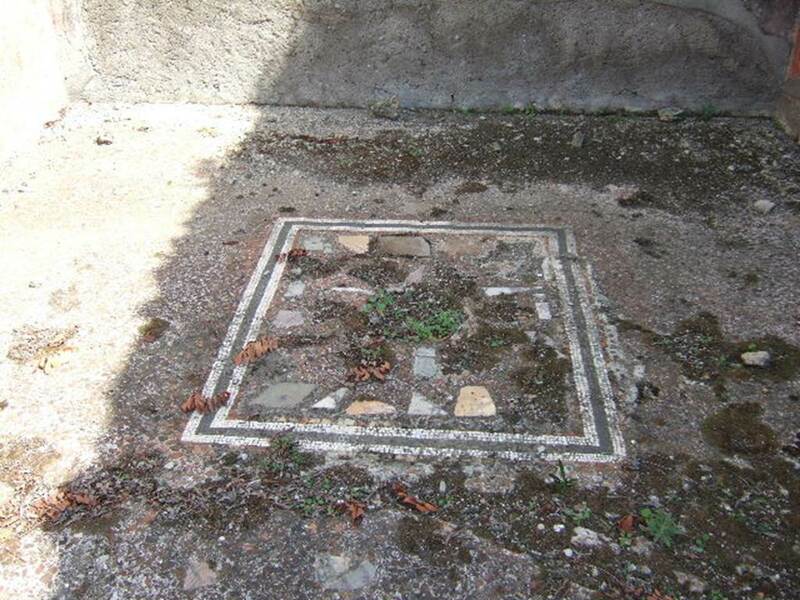 Floor mosaic in triclinium to the left behind the peristyle. 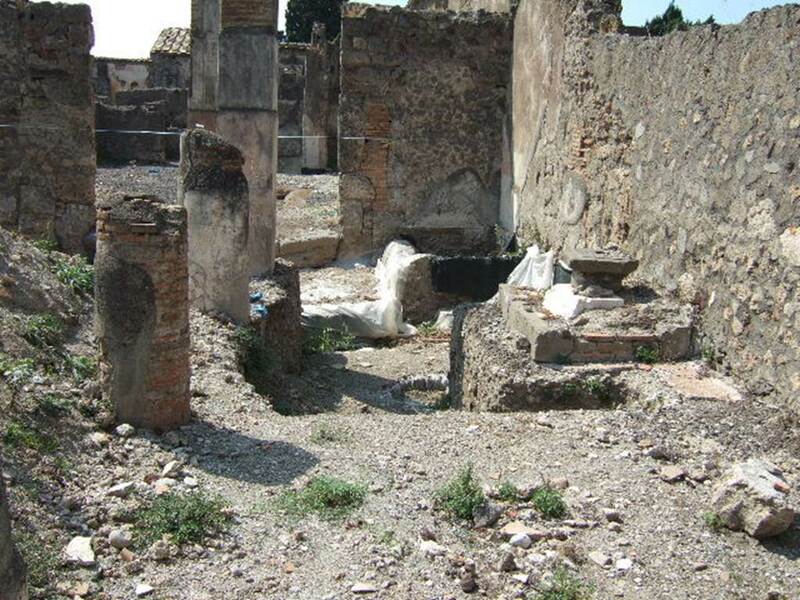 VI.5.21 Pompeii. September 2005. 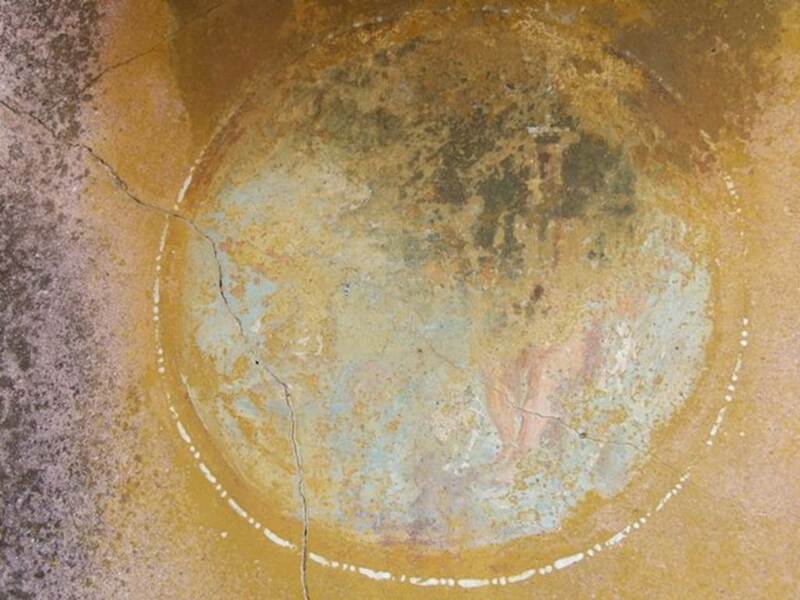 Mosaic from triclinium. 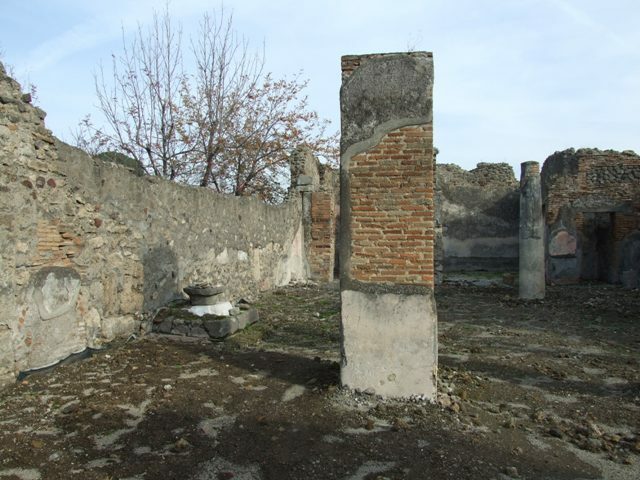 VI.5.5 Pompeii. December 2007. 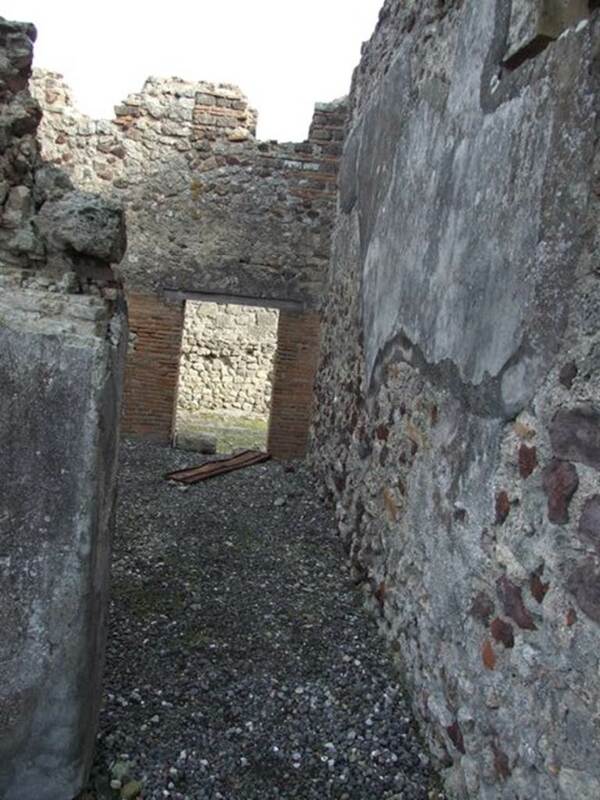 Corridor leading to rear posticum at VI.5.21. 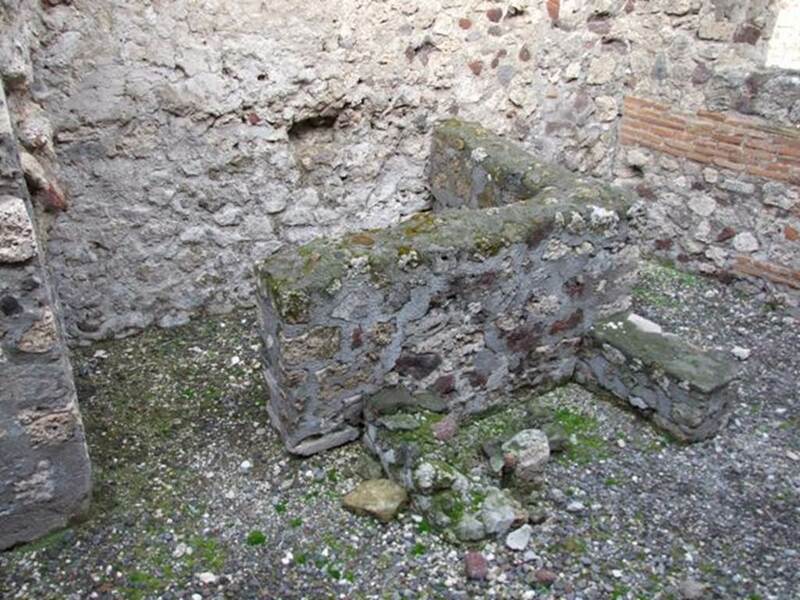 According to Fiorelli, on the left would have been the kitchen and latrine and stairs to an upper floor. VI.5.5 Pompeii. December 2007. 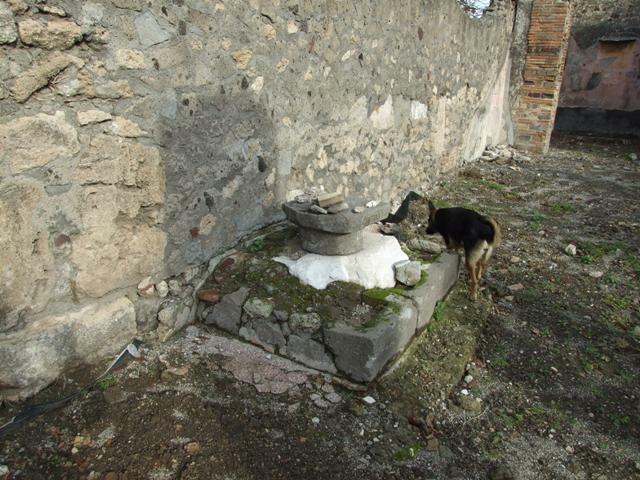 Kitchen and latrine, on north side of corridor leading to VI.5.21. 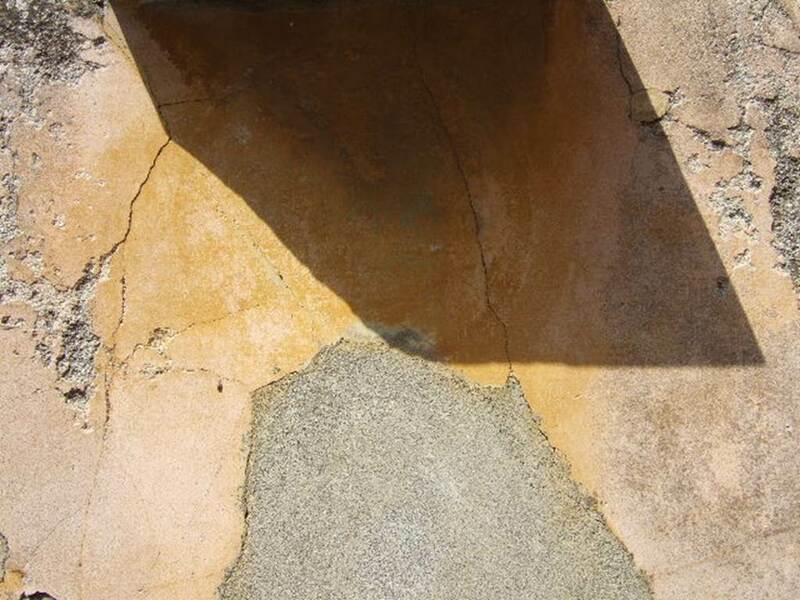 VI.5.21 Pompeii. September 2005. Looking west from peristyle area, along north portico towards atrium. VI.5.5 Pompeii. December 2007. Looking south into ala on the south-east side of the atrium. VI.5.5 Pompeii. December 2007. Doorway into cubiculum in the centre of south side of atrium. VI.5.5 Pompeii. December 2007. Cubiculum on the south-west side of the atrium. VI.5.5 Pompeii. December 2007. Staircase on the west side of the atrium, next to entrance fauces. VI.5.5 Pompeii. December 2007. Looking north-east across atrium, from south-west corner. VI.5.5 Pompeii. September 2005. East wall of atrium with niche, looking towards peristyle. VI.5.5 Pompeii. December 2007. 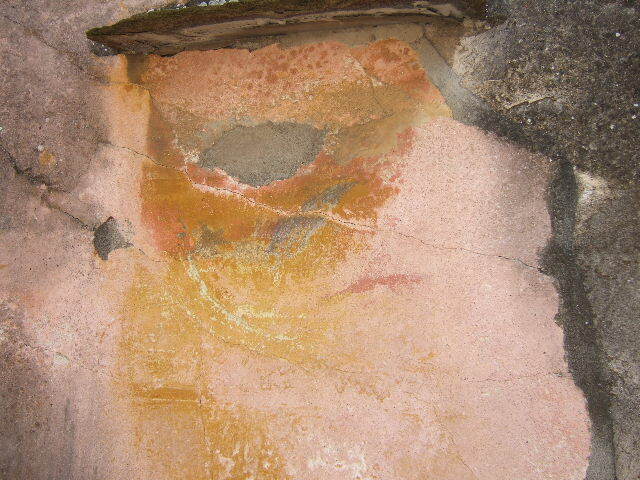 Niche in west wall of atrium. He gave the reference Ann. Inst., x, 1838, 186.